Required Items: 1 Bird snare, Butterfly net, and a few (5 or more suggested) Butterfly jars. 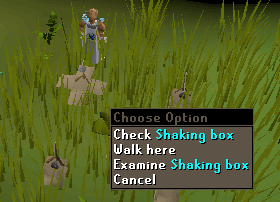 Required Items: Any woodcutting axe (rune or dragon is preferred), a knife, 2 bird snares, a butterfly net, and some (2-5) butterfly jars. A chisel may also be useful. At level 37, with that axe and knife, you can cut down the surrounding trees (regular ones) and use those logs to make deadfall traps (each trap uses 1 log), you will get 204 xp when you catch a spiked kebbit. Adding spiked kebbits to the mix will make those last 6 levels go faster. While hunting Spiked Kebbits, you can use a Chisel to fletch their spikes into bolts (requires level 32 Fletching), which can then be equipped to save inventory space. 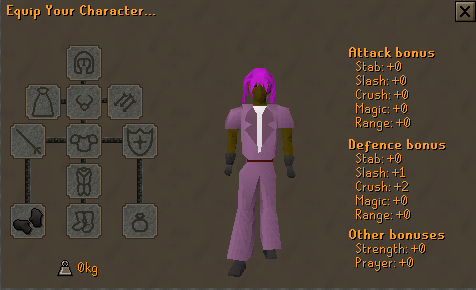 These bolts can be sold for 38-40gp each, and each spike makes 6 bolts. 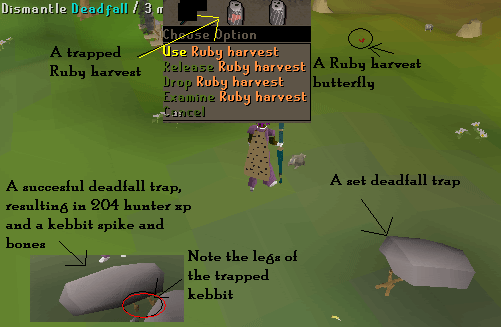 If you're doing a lot of hunting for Spiked Kebbits, this can fetch a decent amount of money! Once you reach level 40, you can set up 3 traps (2 snares and a deadfall). 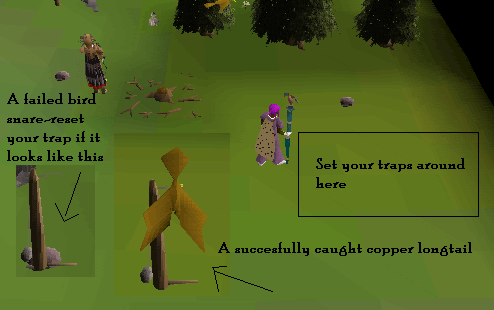 At this point, you shouldn't have enough time to catch butterflies, so focus on your 3 traps at hand. Keep doing this routine until level 43! 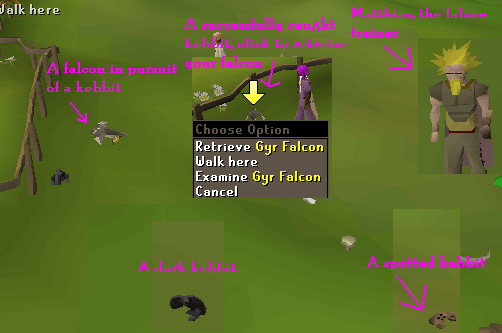 Once you are level 43 hunting, you can use a falcon to hunt spotted kebbits! Required Items: 5 or more Ropes, 5 or more Small Fishing Nets. Required Quests: Priest in Peril. At level 29, you should begin hunting for Swamp Lizards. These levels usually go by quickly, and once you reach level 40 you will be able to set up to three traps at once, making it event easier to train. 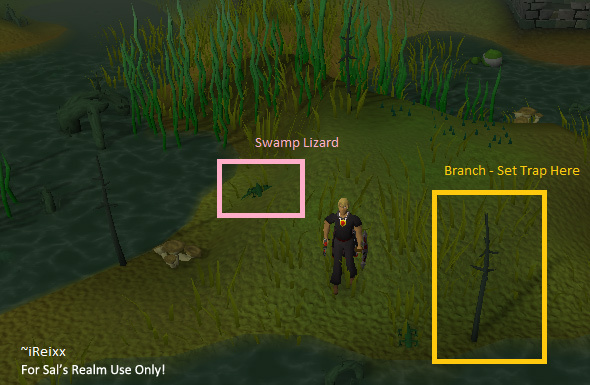 Each Swamp Lizard will earn you 152 experience when caught, and if you train efficiently you can complete this part of your training in as little as two hours. 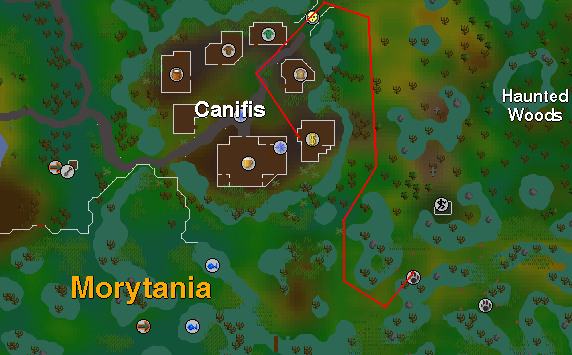 Begin by travelling to the Swamp Lizard area in Morytania, located southeast of Canifis. Once you've arrived at the hunting area, use the nearby branches and set a Net Trap using a Rope and a Small Fishing Net. Use two of the three branches available (until you reach level 40, when you can use all three branches). If you catch a Swamp Lizard, you will see a ball of net on the branch. Collect the lizard and set the trap again. If you fail, you will see your Rope and Fishing Net on the ground. Pick them up and re-set the trap. Rinse and repeat the above steps until you reach level 43. 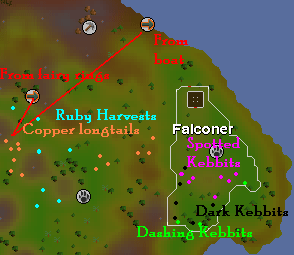 You should use the falconry for this whole block of levels, it may seem like a lot, but once you reach 57 hunting you can catch dark kebbits, so it'll make life easier (there's less crowd and they give 132 experience). At level 43 hunting you can hunt spotted Kebbits. They live on the eastern area of the Piscatoris Hunting Area. In order to get a falcon, talk to* Matthias (who is inside the fenced area with the falconry kebbits). 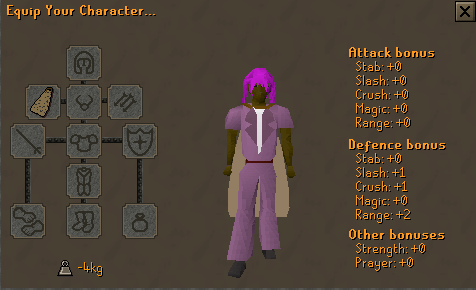 Note: you must not have any weapons, shields or gloves on and you must have at least 500gp in your inventory. He will then give you a large leather glove and a falcon (you cannot leave with these). Required Items: 3 Or more ropes and small nets. Required Items: 4 Or more small nets and ropes (the same amount of both). Good job on making it this far in hunting! You can now set 4 traps! 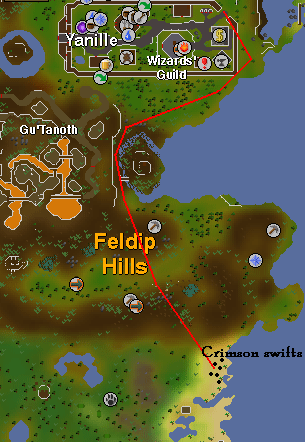 This means you can train on Red Salamanders faster than kebbits. Red Salamanders give 272 xp when caught, and once you find an empty world you'll be cruising through levels. You will need one small nets per one rope (bring 5 of each in case you lose one) in order to catch salamanders. 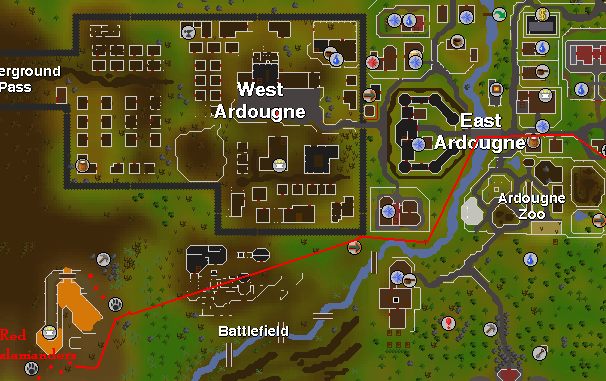 Red Salamanders live south-west of Ardougne near the Scorpius Shrine. 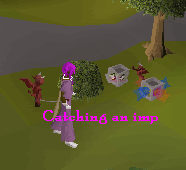 When you can lay 5 traps at a time your training should go faster at the Red Chinchompas. Red Chinchompas are found in the Jungle Hunting Area and there are a lot of good spots in the western part. Make sure you have about 10 traps with you in case you lose some. 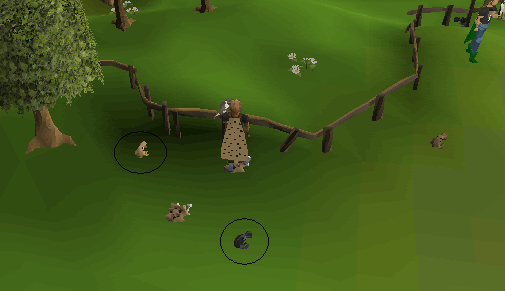 Also this can be profitable when you sell your Red Chinchompas for 700-800gp each (regular Chinchompas sell for about 250-320gp each). 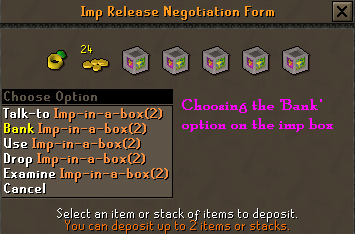 They are stackable so you don't even have to bank. 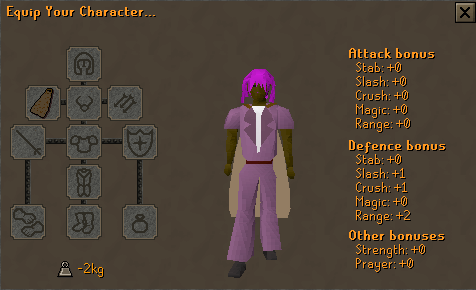 Enjoy the fastest hunter training and good luck on getting the skill cape. At level 99 Hunter, you are eligible to buy a Hunter Skill Cape of Achievement from the Hunter Expert for 99,000gp. 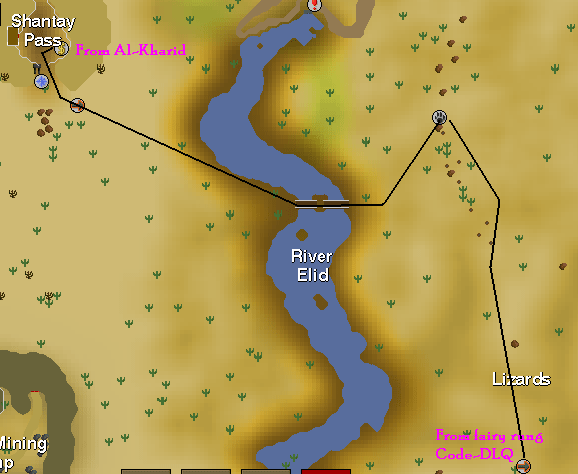 The Hunter Expert is located in a hut south of the Feldip Hills.